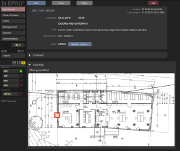 EPRO³ Guardbook is an established and reliable online software for property protection, surveillance, security services, factory security services and industry. It complies with the DIN 77200 and ISO 9001 requirements. The system supports you significantly in the securing of property, the defense of danger as well as in avoiding drawbacks. A monitoring access, a detailed and automatable reporting system and notification functions ensure transparency and a reliable documentation at any time. 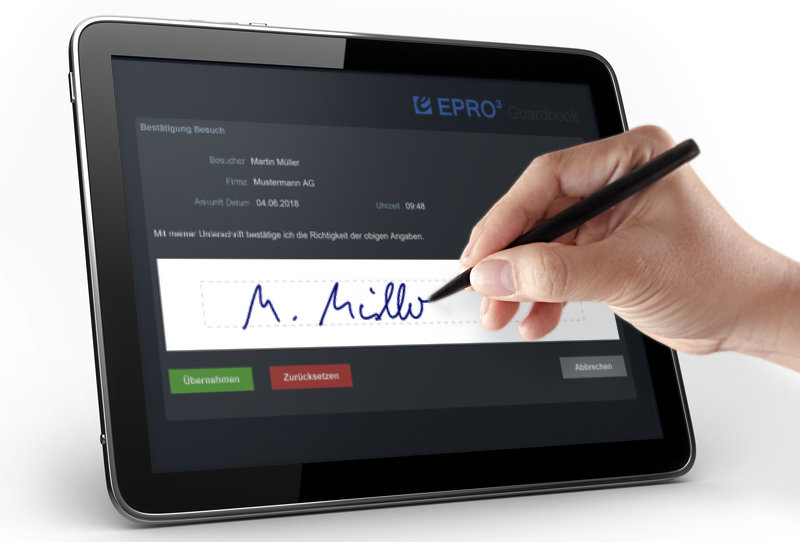 EPRO³ Guardbook is characterized by a comfortable and easy to operate user interface. It is equipped with a consistent multi-client capacity and a special suitability for larger backlogs. With EPRO³ Guardbook you are in control, online and location-independent. EPRO³ Guardbook is being used by industry, commerce and logistics, urban administrations and private and municipal security service providers of every size. It is the most efficient and comprehensive guard book system on the market. 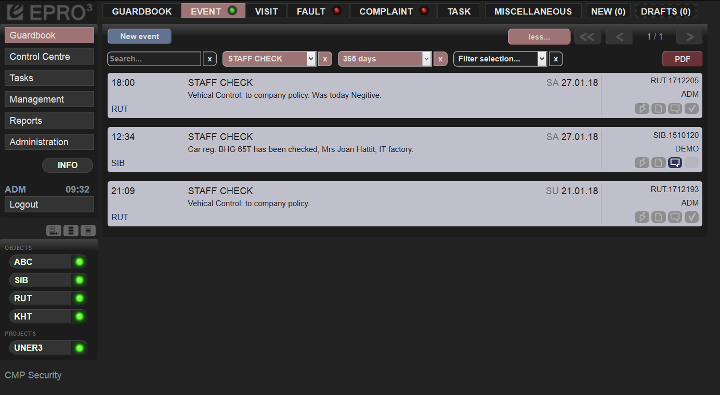 Alongside other effective functions, an extensive fault- and complaint management, a visitor management, a key book, a space administration, a task management and an online travel book have been integrated into the system. A clear structure and the design as a ticket system are essential quality features of EPRO³ Guardbook. Special knowledge for the operation is not required. Users are able to operate the system quickly, since extensive instructions or even trainings are no longer necessary. Our comprehensive video turorial shows you how to optimally use the numerous possibilities of this system for your tasks. The design offers a quick access to all stored information. Even in dim lit rooms and during the nightshifts, the color design supports a fatigue-free workflow. You administrate EPRO³ Guardbook yourself. Therefore, you can customize the system to your assignments at any time. A practical role model simplifies the allocation of access rights and ensures that every employee has only access to areas, relevant to them. With this approved operative structure, the initial training for the software is simple and EPRO³ Guardbook will quickly get the necessary acceptance by your staff. 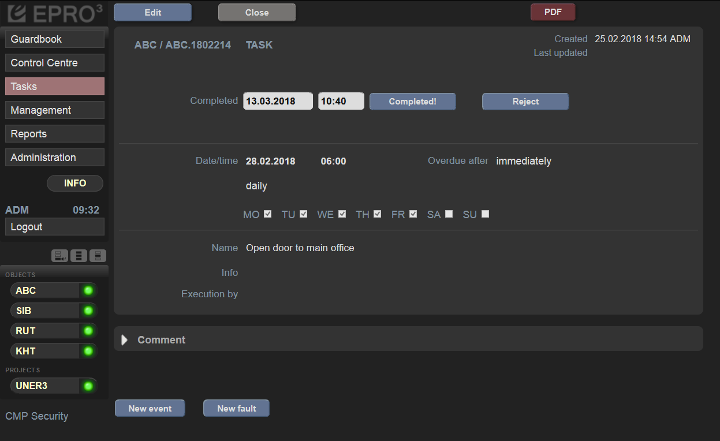 With a well-arranged ticket system you will be able to monitor listed assignments simultaneously and online within the desktop control center. This is ideal for the operation in the security office and the central office. New occurrences are reported to each user individually and acoustically. 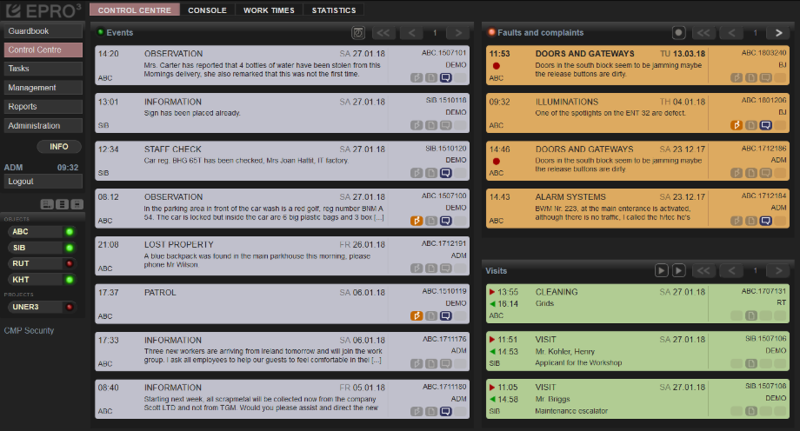 The event- and fault classes of the guard book can be defined freely and provided with notification functions. Every entry can be filtered, grouped in selections and exported directly as a pdf document. EPRO³ Guardbook is able to generate and send preset reports automatically and on a regular basis, if necessary several times a day. You can program your tasks easily in a preset calendar. EPRO³ Guardbook administrates both singular and recurring tasks as well as weekday-timed patterns (e.g. "Tuesdays and Fridays") and intervals (e.g. "biannual"). You administrate this system yourself. 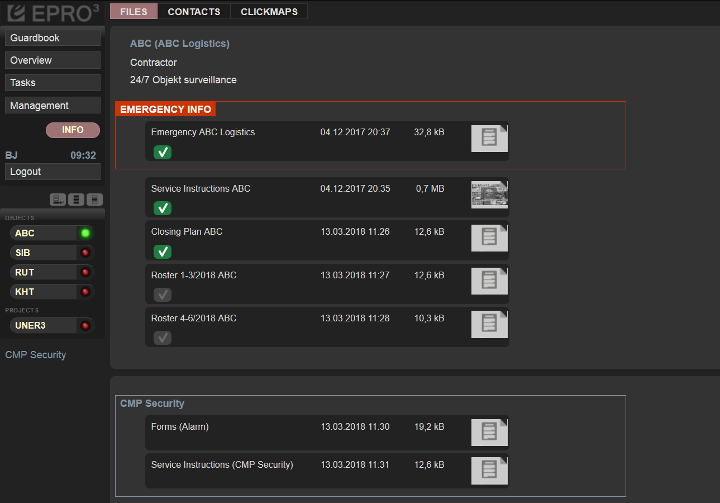 Therefore you are able to customize EPRO³ Guardbook to your individual requirements at all times. Every setting can be made during the operation and you can hide non required working areas. You can store important documents and information of each listed assignment centrally and administrate and publish them in accordance with ISO regulations. In the guard book, you can add file attachments (eg. photos or videos) to any entry. You can use EPRO³ ClickMap to locate events and faults comprehensibly in preset graphics. Mark and administrate technical installations and their time for maintenance optionally. 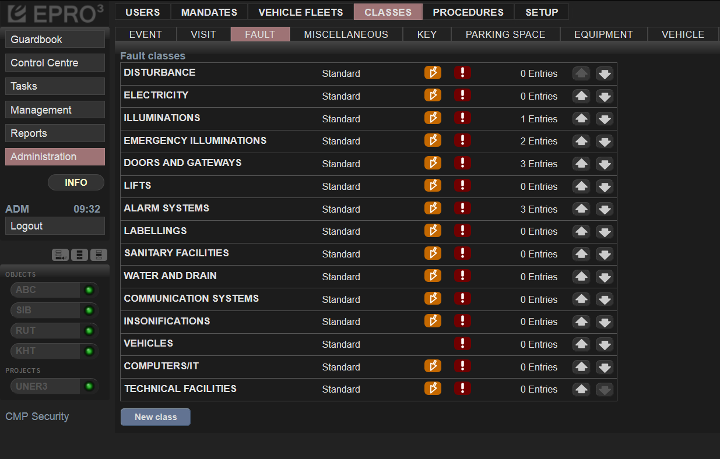 With this features EPRO³ Guardbook can be integrated particularly well into an existing facility management. With the time recording, your employees can document work assignments and activities online. The calculation of working hours is carried out taking account of unpaid breaks, overtime, and/or additional expences. for the support of your orders: Details about the range of functions. If you wish, the EPRO³ Guardbook will allow you to print out report documents electronicaly. After all, your data is always online. By means of the built-in eproSign technology, all signatures that have to be provided, for example, for visitor management, for logbooks, for your hourly reports, or maintenance work etc., can be obtained electronically. You do not need special hardware or installations for this. Simply sign on a standard pad or even your smartphone. By doing this you can save money by eliminating printouts on paper and their administration. As an operator, do you expect your security service provider to use a database system for your reporting? And would you like to be able to request full information, independent of location and time? 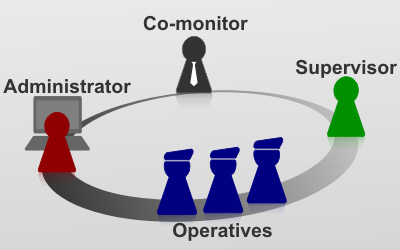 Especially, when operating multiple sites, setting up a separate system is obvious. This enables an optimal integration of processes into existing workflows and structures. EPRO³ Guardbook is therefore also particularly suitable for a parallel representation and a central monitoring of several production sites and larger object inventories. You can operate the system in different languages (multilingual) as well. Create facts and realize an efficient, fast, and affordable overall online reporting with EPRO³ Guardbook. 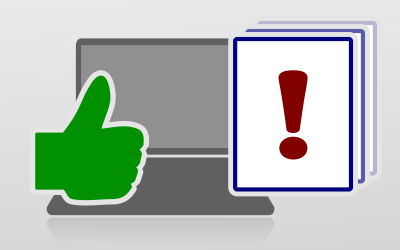 Besides the guard book, EPRO³ Guardbook also includes a fault management, a visitor administration, and administrative data such as key books and a storage space administration, online driver´s logbooks and much more. simply request a test system, free and non-binding. Soon you will receive your personal access data for your EPRO³ Guardbook. A test phase of six weeks enables you to evaluate the software in operation. a further use is possible without any data loss.